[ACT](VC): Legion20000 "Blue Storm Marine General, Milos" (If your opponent's vanguard is grade 3 or greater, this unit may return four cards from your drop zone into your deck once, search your deck for the specified card, and Legion) [AUTO](VC):[Choose a card with the same name as a unit on your (VC) from your hand, and discard it] At the end of the battle that this unit attacked a vanguard, if this unit is Legion, and if it is the fourth battle of that turn or more, you may pay the cost. If you do, exchange all of your rear-guards in any positions, choose up to two of your rear-guards, and [Stand] them. 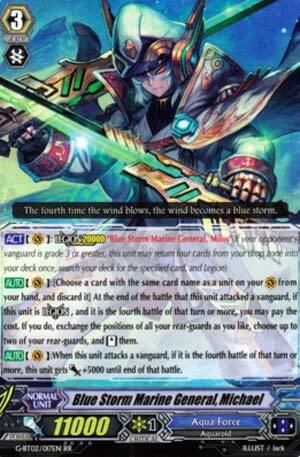 [AUTO](VC):When this unit attacks a vanguard, if it is the fourth battle of that turn or more, this unit gets [Power]+5000 until end of that battle. Soldiering forward with our reviews of G Booster 2, we have a new Legion for Aqua Force and Blue Storm, basically. Michael Legions with fellow Blue Storm Milos, and as your reward, if he attacks 4th, you can sacrifice a copy of himself or Milos from the hand to arrange your rear-guard as you see fit, then stand 2 of your rear-guards. His normal skill is to gain 5k when attacking 4th. This would have actually been pretty nifty if he got released in the Legion Format of old, but now he's largely completely unnecessary. Because Lambrose. Lambrose doesn't -1 you to stand 2 rear-guards and can hit for basically larger numbers (26k against 25k means 5k more guard against an 11k VG, you know). Milos sadly doesn't justify this much since even normal decks have Tidal Assault. Resist is sort of nice but not a be-all end-all reason to use something worse. Michael's a bit behind the times to really matter. Unless you want to run something not called Tetra-Burst Dragon. Well, we're finishing up G-BT02 this week, I think. To kick things off, we're picking up where we left off last week by staying with the navy forces of Cray. A Type-2 legion that, regardless if in Legion or not, can swing with an extra 5000 power so long as it's the 4th attack or more that turn. And, if you happen to be in Legion and Persona-Blast, well, then you get to yell out "CHANGE PLACES!" and restand two units after swapping everything on your board around. Overall, a pretty good Legion, works with either of the previous Legions pretty well from what I've seen. The mate? Well, he's Tidal Assault if you're in Legion, plus he can't be retired or locked by targeting effects thanks to the new skill, resist. Get used to it, clans that are rear-guard dependent, will come to rely on it. Resist also affects the Vanguard circle, so Blaster Joker can't retire it and the guardian circle, so Daikaiser can't just punch through it.